These days, it’s difficult to drive more than a few blocks without passing the local neighborhood laundromat. Even smaller towns feature one or two of these brightly lit fixtures of 20th century America. The first public laundromat to open in the United States appeared in Fort Worth, Texas in 1934. At the time, it was called a washateria and staffed by an attendant who oversaw a number of manual clothes washers. Three years later a coin-operated version of the automatic clothes washing machine appeared, establishing an effective business model that has more or less endured ever since. Negating the need for an attendant it ushered in the fully-automated wash-and-dry experience we all recognise today. Laundromats soon sprang up in every town in the country. Locations with large concentrations of non-permanent tenants (such as apartment buildings, college dormitories and military bases) will often have coin-operated laundry machines available on their premises. These are inspected and maintained by specialist companies. All ‘route-based’ laundry machines are fully self-service, coin-operated and generally maintained by one or more company staff who travel from machine to machine (on their route) collecting money and repairing them when required. 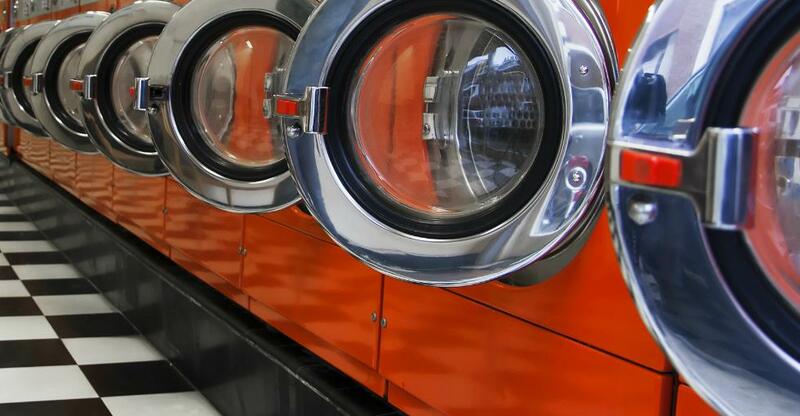 Most self-contained laundromat locations are also fully self-service and coin-operated, with little or no staff supervision outside of necessary cleaning and maintenance and collection of money. These locations are often (though not always) open 24 hours a day to maximize convenience for customers who need to fit a trip to the laundromat into a busy schedule. Some laundromats offer additional services. They may have a staff member on hand to monitor machines for security purposes (so no-one’s clothes are stolen) and sell laundry detergent and dryer sheets. Other locations offer services such as folding, pick-up and drop-off and dry cleaning –particularly lucrative in affluent areas or those near office buildings. This entrepreneur even incorporated a cafe-bar into his San Francisco-based laundromat. More often than not, a laundromat’s success hinges on demographics: population centers with a high number of renters will support more laundromats than those dominated by homeowners. As long as these locations are spaced a reasonable distance apart, local residents will generally go to the closest one, since price and available services are rarely a differentiating factor in this business. However, in urban and other densely populated areas, competition can be fiercer with additional services and better value sometimes critical in wresting custom from competitors. Between self-contained locations and individual route locations within other buildings, there are more than 32,500 laundromats with a combined annual revenue of more than $5 billion operating in the US. While the US laundromat industry is considered mature – meaning it is not poised for dramatic growth – entrepreneurs who buy the right laundromat can inherit a solidly regular clientele and a steady, reliable income. It’s not likely to make you rich – unless you acquire multiple locations and alight upon a particularly efficient business model – but revenue will probably remain fairly steady as the number of renters in any given area tends to be stable over time. Economic downturns: when the economy stagnates or shrinks, many homeowners find themselves renting again and/or are hesitant to repair or replace broken-down washers and dryers at home, necessitating the use of a laundromat. Increased rental traffic: when the local population of renters grows dramatically, such as when an apartment complex or condominium is built, or a local college expands, the demand for reliable laundry services will increase with it. There is a trend in the US laundromat industry towards ‘going big’: larger capacity washers and dryers (with higher prices but fewer total loads) and larger premises to accommodate more simultaneous customers. In some cases, newer, larger facilities with larger-capacity machines can gain market share in a competitive area because they can shave as much as an hour off the time it takes for each customer to complete what is, after all, a chore. A coin-operated laundromat requires no industry experience or technical expertise. What matters, above all, is having the nous to study the demographics of a given area and pick your location carefully. And – if you’re in a competitive area – you need to price yourself competitively and offer the right mix of additional services. For the shrewd entrepreneur, this remains a time-honoured way of building a reliable, non-stressful income.